The Helix Nebula is a large planetary nebula located approximately 695 light years from Earth in Aquarius constellation. It is the nearest bright nebula to our solar system. 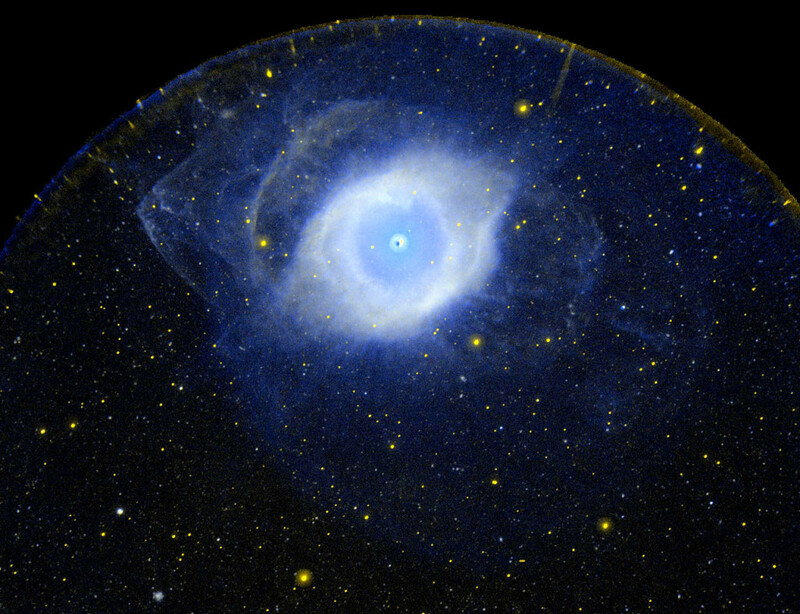 The nebula’s striking appearance earned it the nickname the Eye of God. The Helix Nebula is a popular object for amateur astronomers and can be observed with binoculars, which reveal it as a hazy, greenish cloud. The nebula appears as almost one-half the Moon’s diameter. The ring shape can only be resolved with large amateur telescopes, and the nebula’s radial streaks cannot be seen except through the largest ground-based telescopes. NGC 7293 was the first planetary nebula discovered to have cometary knots, which many planetary nebulae were later discovered to contain. Each of these knots contains bright cusps and tails, and they all extend away from the central star in a radial direction. Most of the knots are believed to be roughly the size of the solar system. The nebula is believed to contain about 20,000 cometary knots. The Helix Nebula is also interesting because it appears really similar across a wide spectrum, from ultraviolet to infrared, and is easy to recognize at all these wavelengths even though there are noticeable differences in the nebula’s appearance. 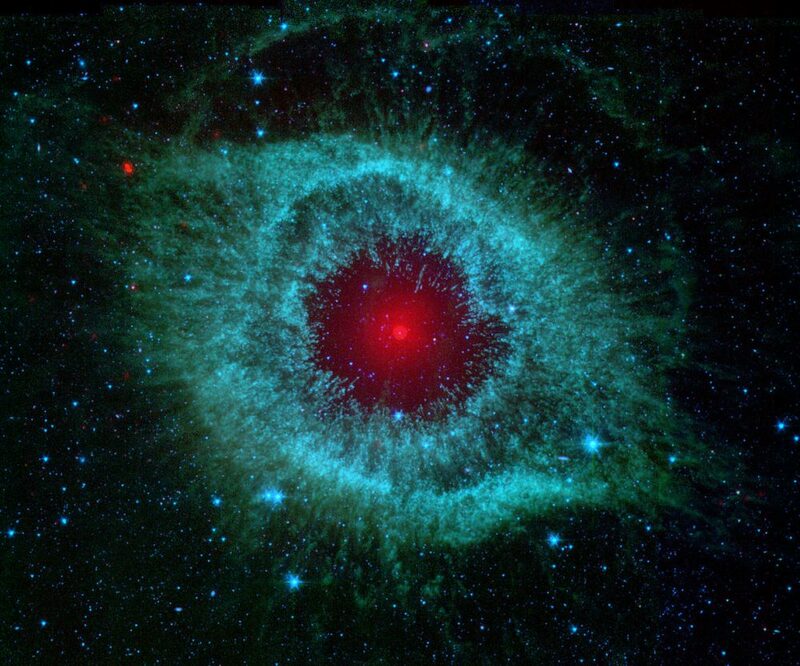 In Spitzer’s infrared view of the Helix nebula, the eye looks more like that of a green monster’s. Infrared light from the outer gaseous layers is represented in blues and greens. The white dwarf is visible as a tiny white dot in the center of the picture. The red color in the middle of the eye denotes the final layers of gas blown out when the star died. The brighter red circle in the very center is the glow of a dusty disk circling the white dwarf (the disk itself is too small to be resolved). This dust, discovered by Spitzer’s infrared heat-seeking vision, was most likely kicked up by comets that survived the death of their star. Before the star died, its comets and possibly planets would have orbited the star in an orderly fashion. But when the star blew off its outer layers, the icy bodies and outer planets would have been tossed about and into each other, resulting in an ongoing cosmic dust storm. Any inner planets in the system would have burned up or been swallowed as their dying star expanded. So far, the Helix nebula is one of only a few dead-star systems in which evidence for comet survivors has been found. This image is made up of data from Spitzer’s infrared array camera and multiband imaging photometer. Blue shows infrared light of 3.6 to 4.5 microns; green shows infrared light of 5.8 to 8 microns; and red shows infrared light of 24 microns. Image: NASA, JPL-Caltech, Univ. of Ariz. The Helix Nebula spans about 2.87 light years. Its official designation in the New General Catalogue is NGC 7293. The nebula’s inner disk is 8×19 arcminutes in diameter, the outer torus has a diameter of 12×22 minutes of arc, and the outermost ring is roughly 25 arcminutes in diameter. The nebula was discovered by the German astronomer Karl Ludwig Harding in the early 19th century. It has an apparent visual magnitude of 7.6 and expands at the rate of 31 kilometres per second. The nebula’s inner disk expands at a rate of 32 kilometres per second, and the outer ring’s expansion rate is estimated at 40 kilometres per second. The nebula’s age is estimated to be around 10,600 years.